Spotlights are one of the most versatile types of solar lights in terms of what’s available and how you can use them. Need extra light in an area difficult to reach with electricity? Check! Want choices between continuous on or Motion Detection? No problem. Looking for a no-fuss way to add drama to a special landscape feature? Easy! 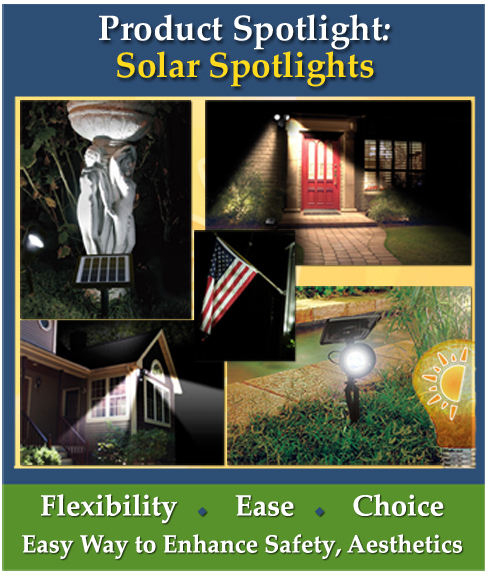 Our solar spotlights are great for all of the above. Whether you want to make a dark area safer, people entering your property, or enhance the look and feel of your landscape, solar spotlights may be the perfect solution. No messy messy low-voltage transformer systems, no electrical wiring, no expensive trenching and repairing walkways, lawns or gardens. Along with different budget options, we offer spotlights with lots of choices in style, function and operating modes. Bright white, warm white, and even colored spotlights are available. Choose between ground or post/wall mount, with some models that let you choose between the two with one unit. This entry was posted in Selecting & Caring for Solar Products, What's New and tagged free shipping, outdoor solar lights, solar accent lights, solar security lights, solar spot lights, solar spotlights by SolarLightingSmart. Bookmark the permalink.